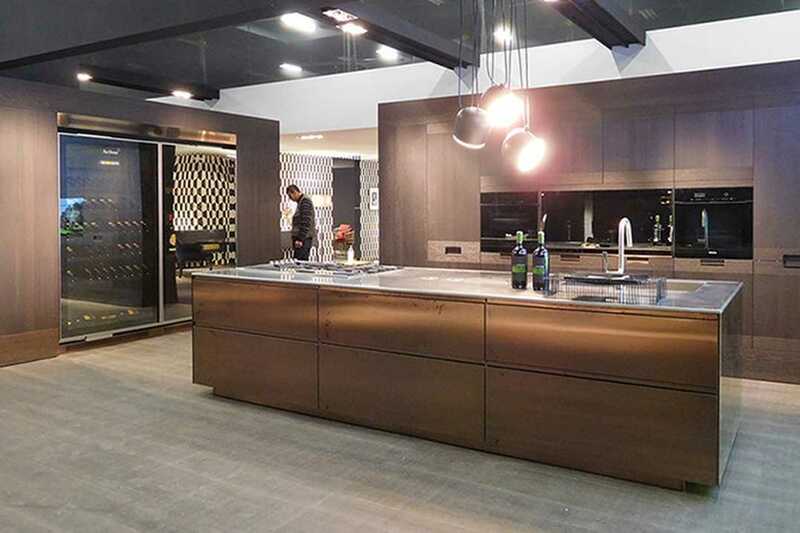 With great success Arclinea introduced their newest project Principia along with the Vina Epicure at IMM Cologne. Principia is the new design by Antonio Citterio for Arclinea it combines a grained wood finish with stainless steel in the innovative colours created with the PVD (Physical Vapour Deposition) technological process. Steelia collection, the PVD collection by Arclinea, is the reiteration of steel as one of the quintessential materials of the Arclinea style, due to its durability, functionality and hygiene. Vina Epicure is the wine storage unit and is part of the Winery Collection by Arclinea: a collection of furniture designed for storage and preservation of wine at the optimum temperature, for home use or even for wine bars, pubs and restaurants. With Stopsol double-glazing doors complanar closing system, internal LED lighting with volumetric sensor that switches on when the door is opened, VINA EPICURE teams a refrigerating unit VINA (internal temperature between 12° and 16°C), with a Beverage Centre unit fitted with a Humidor for correct storage of cigars.